Get out those gardening tools and seed catalogs: it's time to get dirty! Many adults are rejoicing for spring's return to gardening, and why shouldn't kids get involved too? Getting your kids interested in gardening at an early age is a great way to connect them with nature, help them learn basic botany and biology, and give them a chance to get into some good, not-so-clean fun! From tiny tots to big kids, any kid can take up gardening. 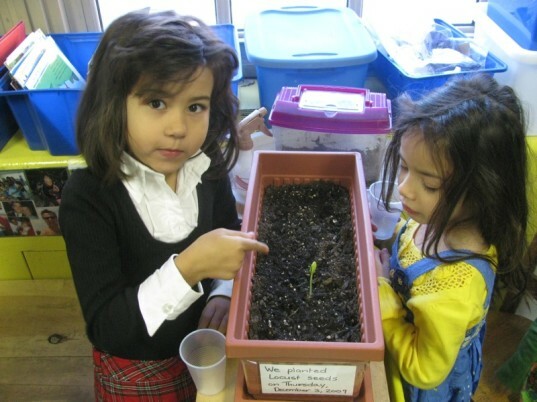 Read on for 7 ways to give your child a bright green thumb and create a lifetime nature lover! Putting a plant in their living and sleeping space is a wonderful, immediate way for them to cultivate an interest in gardening: they will see their plant every morning when they wake up! For younger kids, be sure to place the plant out of their immediate reach: all that soft, messy soil is just too tempting! Kids will quickly learn about the need for light and water. And having such a big responsibility is also a great way to let them subtly understand how much work that dog they have been begging you for will be in comparison. Your child’s environment will also get a boost from a plant – peace lilies, spider plants, aloe vera plants and ficus trees are all known to be great for detoxifying the air naturally (as well as for their low maintenance needs). Terrariums have the whimsical feeling of a miniature world and can be made with everyday objects. Open your child’s eyes to all the gardening possibilities and visit local garden centers, farms or horticultural centers (in addition to reading great gardening books with them). These green spaces are fun places to explore and may even have child-geared activities or workshops. 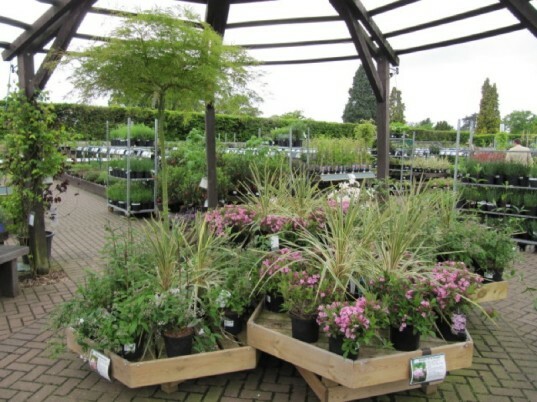 Experienced staff is also often on hand to offer advice for kid-friendly plantings. Showing children about the huge variety that exists (from ferns to tropical plants to cacti) will introduce them to the idea of how diverse plants are suited to different climates and environments. Save a corner or a row of the garden for your little one (or even just a pot, if space is tight). Show them a variety of seeds suitable for growing in that space and encourage them to choose to grow a flower they like the smell of or a new vegetable they might like to try. Then let them make the actual decisions as to what their space will include. Allow kids to explore “their” garden on their own terms. For some kids, that might be building a rock garden or designing a fence to keep nosy animals (or siblings) out. For others, it may be digging in the dirt with Mom or Dad’s tools. Older kids can even get a bit of math instruction as well when you show them how certain seeds need to be placed ¼ inch or 1/8 of an inch below the soil and how plants also need to be spaced apart accordingly to allow for growing room. The important lesson is that playing in the dirt and growing things is a fun activity that can grow and change over the years, just like them! 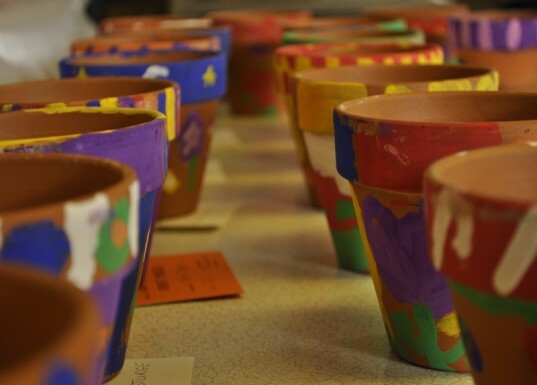 Inspire other mini green thumbs by having a few kids (and maybe even their parents) over to paint some planters. Tots will get even more excited about what they can put in their artistic creation. 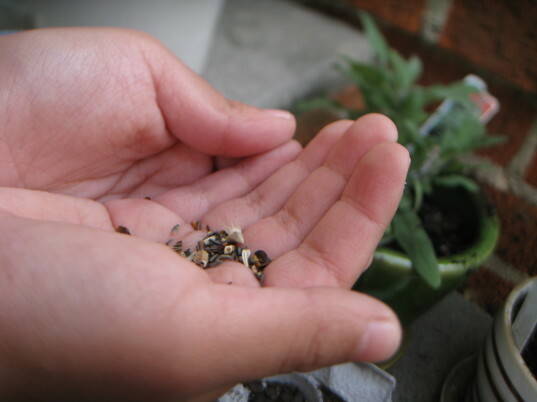 Kids can choose what seeds they want to bring home and plant later, adding some greenery to their own homes. Use eco-friendly paints to get the job done! Let children witness the whole process, from starting seedlings indoors, to replanting outside, to weeding to harvesting. Starting seeds indoors allows kids who live in cooler climates to have a longer growing season since they don’t have to wait to plant outside. A windowsill garden of herbs is great for starting (and keeping) indoors and may tempt even the pickiest eater to try some new flavors. Younger kids often love the little daily jobs like weeding and watering so encourage them to check out “their” garden every day. They’ll also look at what’s on their plate in a whole new way once they see all the work and time that goes into producing food and flowers. And just because the growing season is over, the fun doesn’t have to stop. Kids can learn about composting and how to keep garden beds healthy throughout the winter. Equip kids with a notebook and some crayons or pencils. In addition to recording the growth of the plant, they can also detail the weather, the animals or insects that come to visit, or anything that inspires them while outside. Help little ones point out plant or flower colors that match their crayons, and tell them to scribble away to design their dream garden. Journaling is a fun activity in the heat of the summer when it’s too hot to do much of anything outside! Other journaling ideas include helping kids make collages from gardening catalogs, writing poems or doing leaf or rock rubbings. Keeping the journal is also a great way to make the gardening experience a more longterm one – children can go back and see what worked and what didn’t and make plans for next season or next year. 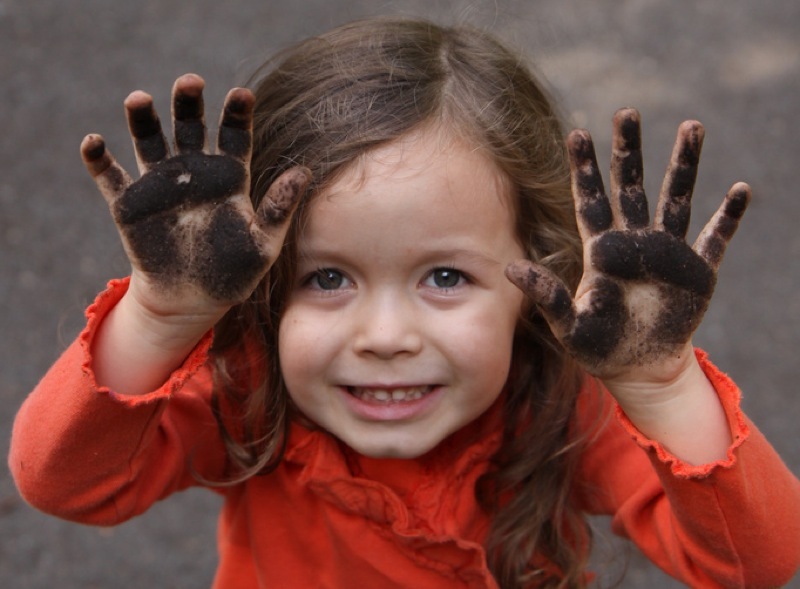 If your child’s teachers are agreeable to it, suggest making gardening a classroom activity. It’s a great hands-on activity that really puts science and nature into action. 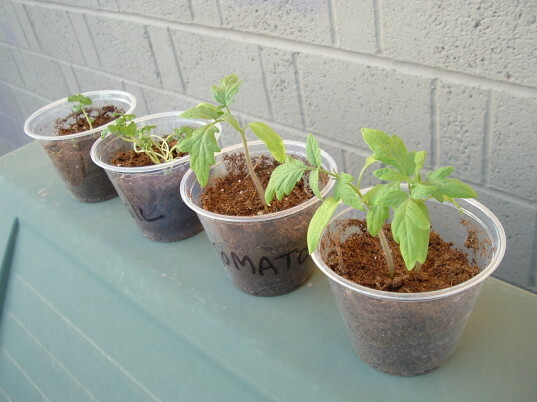 Sometimes peer pressure can be a good thing – whether they are watching to see whose seed sprouts first or learning from each other’s mistakes (such as overwatering) the excitement that the kids will have about watching new life grow is infectious! Feeling very ambitious? Help start a school garden – it could transform life at your child’s school! Laying out the elements for my terrarium. Your child's environment will also get a boost from a plant - peace lilies, spider plants, aloe vera plants and ficus trees are all known to be great for detoxifying the air naturally (as well as for their low maintenance needs). 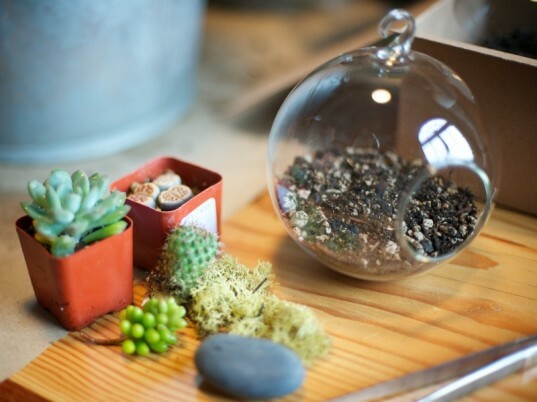 Terrariums have the whimsical feeling of a miniature world and can be made with everyday objects. Allow kids to explore "their" garden on their own terms. For some kids, that might be building a rock garden or designing a fence to keep nosy animals (or siblings) out. For others, it may be digging in the dirt with Mom or Dad's tools. Older kids can even get a bit of math instruction as well when you show them how certain seeds need to be placed ¼ inch or 1/8 of an inch below the soil and how plants also need to be spaced apart accordingly to allow for growing room. The important lesson is that playing in the dirt and growing things is a fun activity that can grow and change over the years, just like them! Let children witness the whole process, from starting seedlings indoors, to replanting outside, to weeding to harvesting. Starting seeds indoors allows kids who live in cooler climates to have a longer growing season since they don't have to wait to plant outside. A windowsill garden of herbs is great for starting (and keeping) indoors and may tempt even the pickiest eater to try some new flavors. Younger kids often love the little daily jobs like weeding and watering so encourage them to check out “their” garden every day. They’ll also look at what’s on their plate in a whole new way once they see all the work and time that goes into producing food and flowers. And just because the growing season is over, the fun doesn't have to stop. Kids can learn about composting and how to keep garden beds healthy throughout the winter. Equip kids with a notebook and some crayons or pencils. In addition to recording the growth of the plant, they can also detail the weather, the animals or insects that come to visit, or anything that inspires them while outside. Help little ones point out plant or flower colors that match their crayons, and tell them to scribble away to design their dream garden. Journaling is a fun activity in the heat of the summer when it's too hot to do much of anything outside! Other journaling ideas include helping kids make collages from gardening catalogs, writing poems or doing leaf or rock rubbings. Keeping the journal is also a great way to make the gardening experience a more longterm one - children can go back and see what worked and what didn’t and make plans for next season or next year. If your child’s teachers are agreeable to it, suggest making gardening a classroom activity. It's a great hands-on activity that really puts science and nature into action. Sometimes peer pressure can be a good thing - whether they are watching to see whose seed sprouts first or learning from each other’s mistakes (such as overwatering) the excitement that the kids will have about watching new life grow is infectious! Feeling very ambitious? Help start a school garden - it could transform life at your child's school!